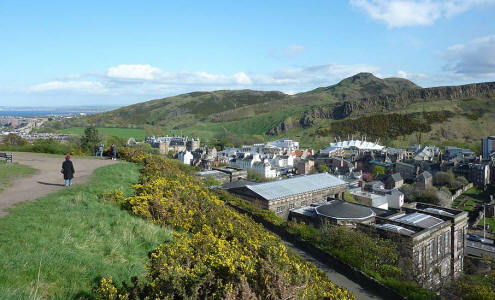 View of the Calton Hill with its many monuments and structures. Each is described and shown in more detail below. 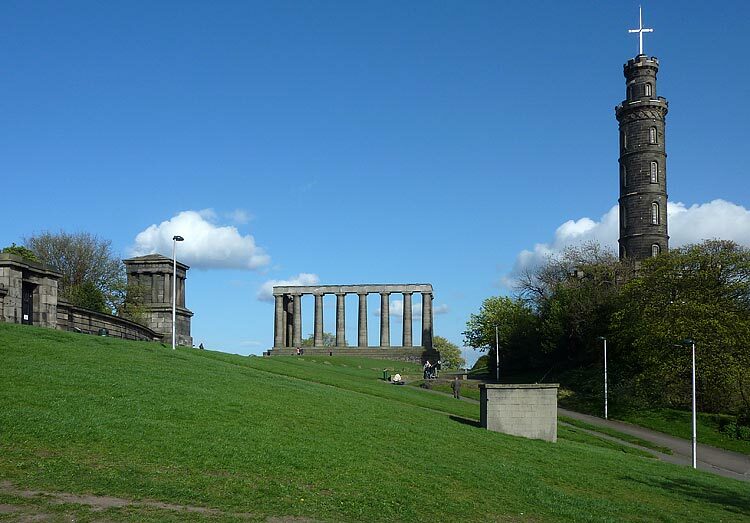 The Calton Hill is the famous viewpoint of Edinburgh, with the most famous view being towards Edinburgh Castle and along Princes Street, with the circular Dugald Stewart monument in the foreground. 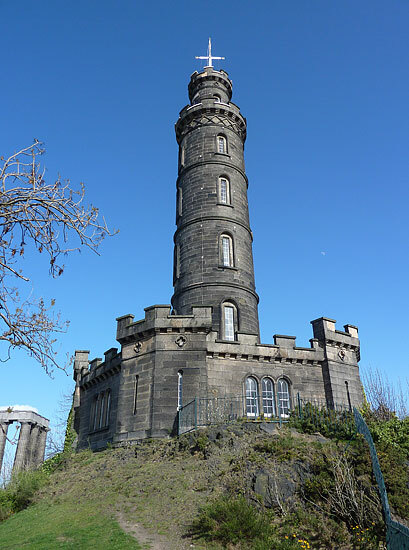 More on the Dugald Stewart monument on a separate page. 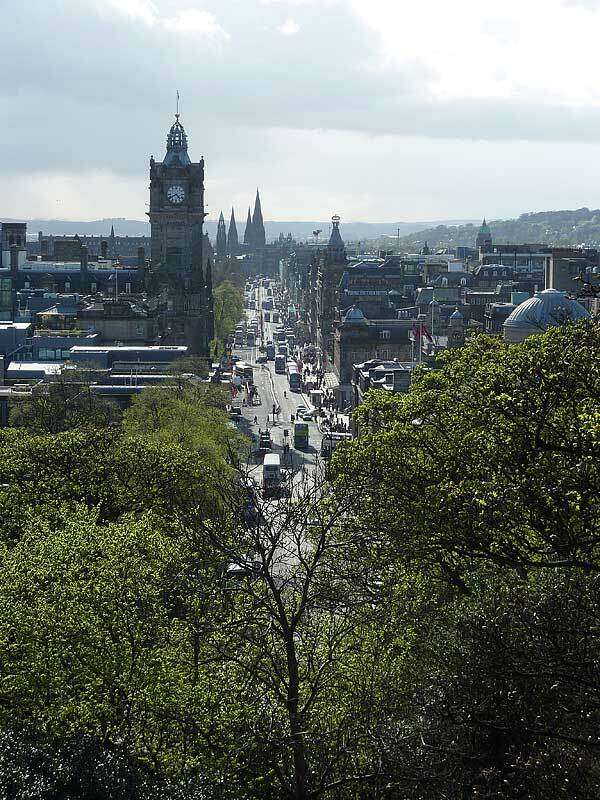 The clock tower belongs to the Balmoral Hotel, previously North British Hotel, at the east end of Princes Street. 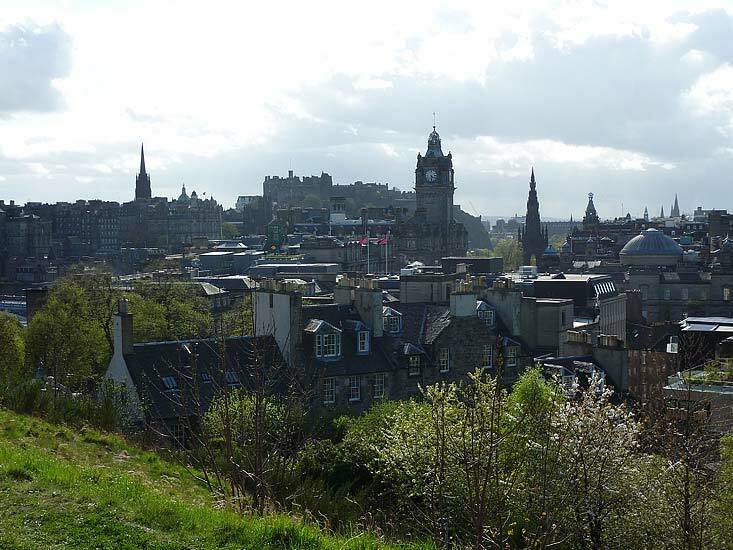 A little beyond that is the Gothic pointed Scott Monument (to the right of the clock tower in the first and last picture). 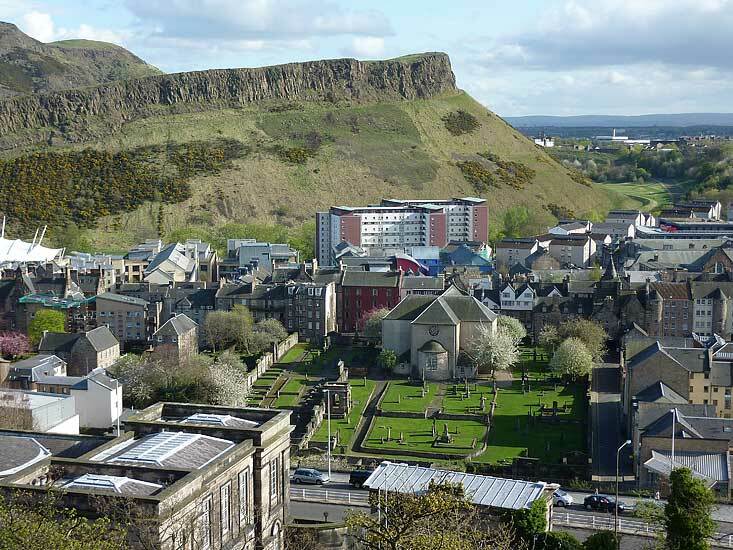 The spire to the left of the castle is the old Highland Tolbooth St. John's Church at the top of the Royal Mile, no longer used as a church and now called The Hub. 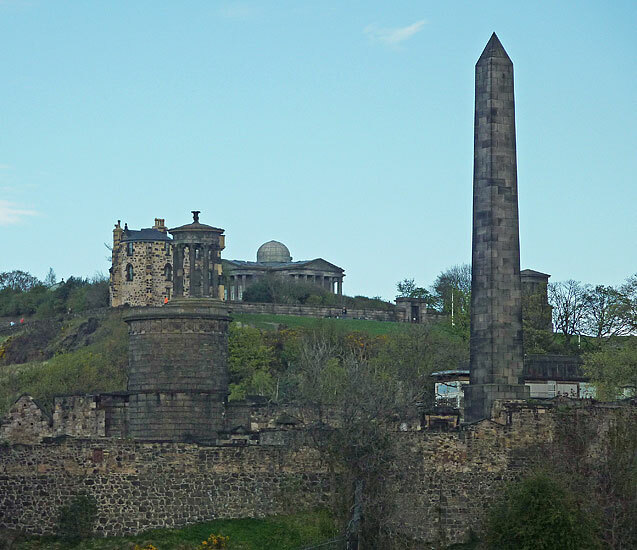 and the Nelson Monument on the right (click on photo to enlarge). 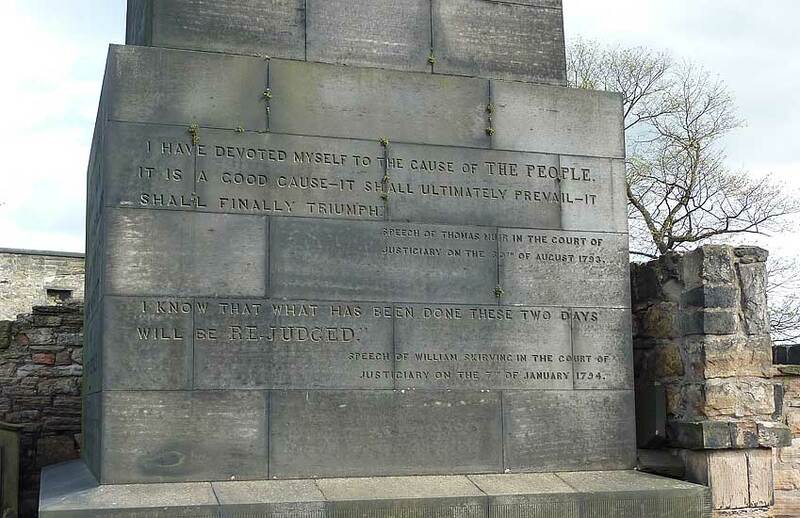 NATIONAL MONUMENT to the left of the Nelson Monument. An unfinished Parthenon for which C.R. 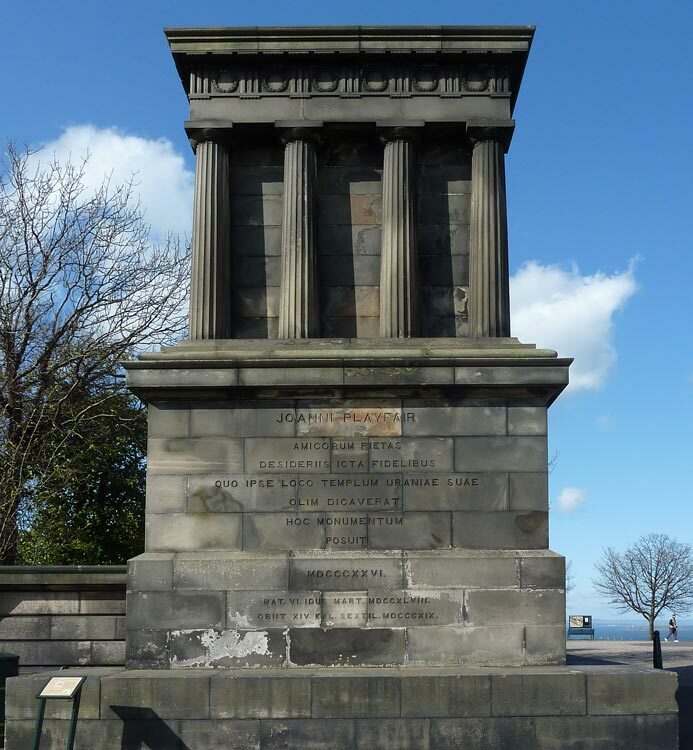 Cockerell and William H. Playfair were responsible. 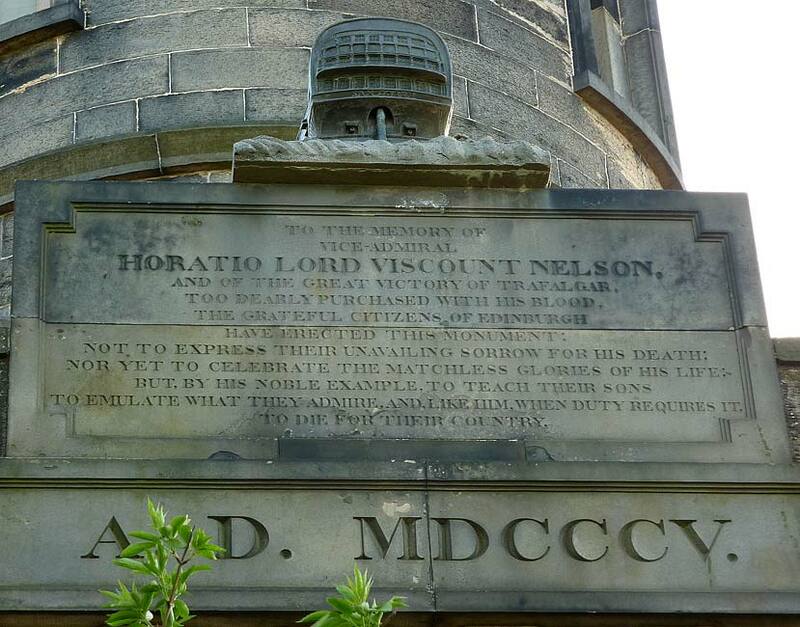 The project for a monument to those who had fallen in the Napoleonic Wars had been in the air since 1815 ... 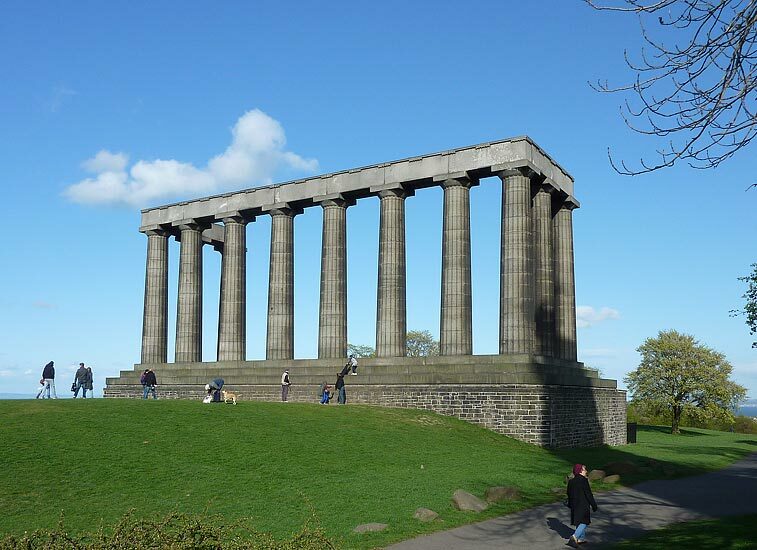 In 1822 the promoters (including Scott, Cockburn and Lord Elgin) appealed for £42,000 'to erect a facsimile of the Parthenon'; less than half was ever subscribed. 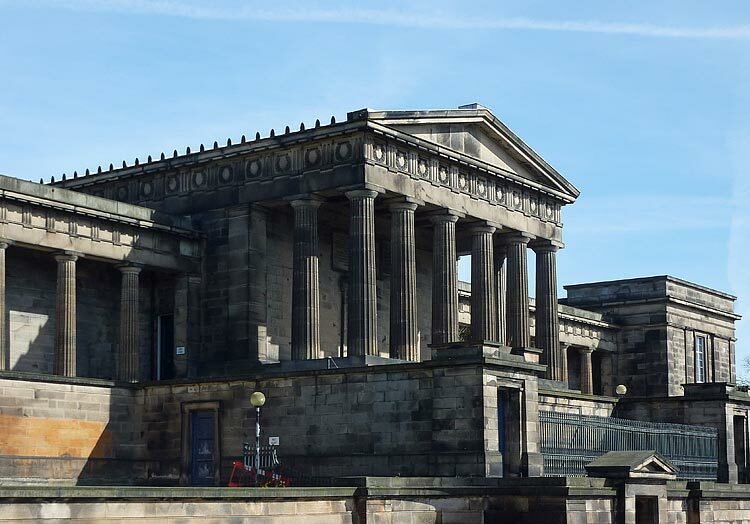 ... Work began in 1826 and came to a halt in 1829, with only part of the stylobate (base for a colonnade), twelve columns at the W end and their architrave faultlessly completed in Craigleith stone. 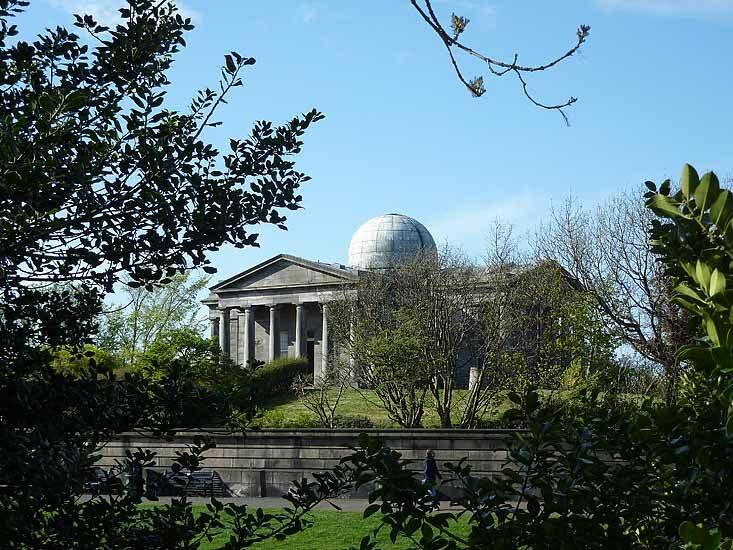 First built, the Gothic OBSERVATORY HOUSE, at the SW corner of the boundary wall, was started in 1776 and after a break, when money ran out, was finished in 1792. 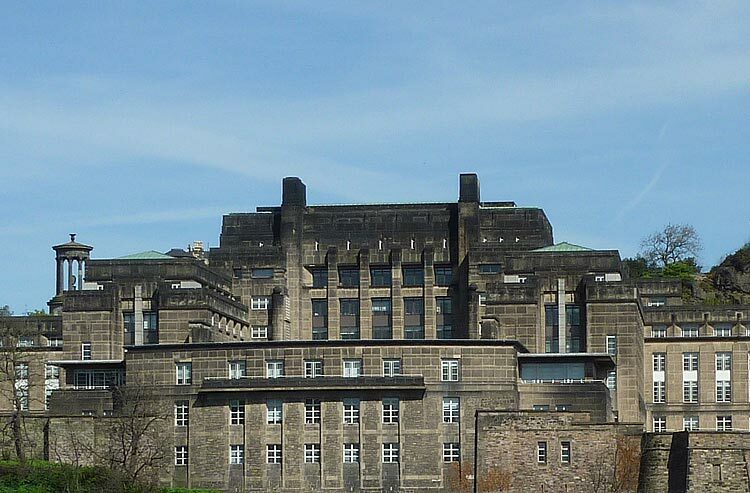 The architect was James Craig, with the benefit of advice (and possibly a sketch) from Robert Adam, who suggested it should look like a fortification. 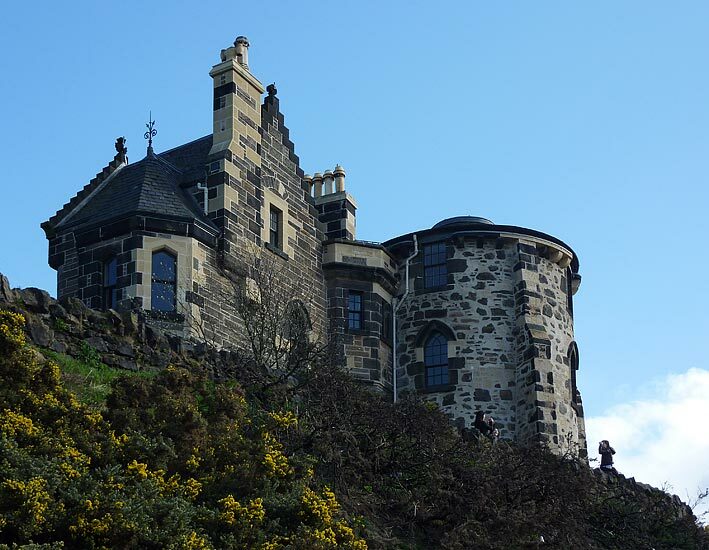 To a three-storey round tower is attached a short wing, coarsely built of rubble with buttresses, Gothic windows, and wall-head corbels perhaps intended to support battlements. 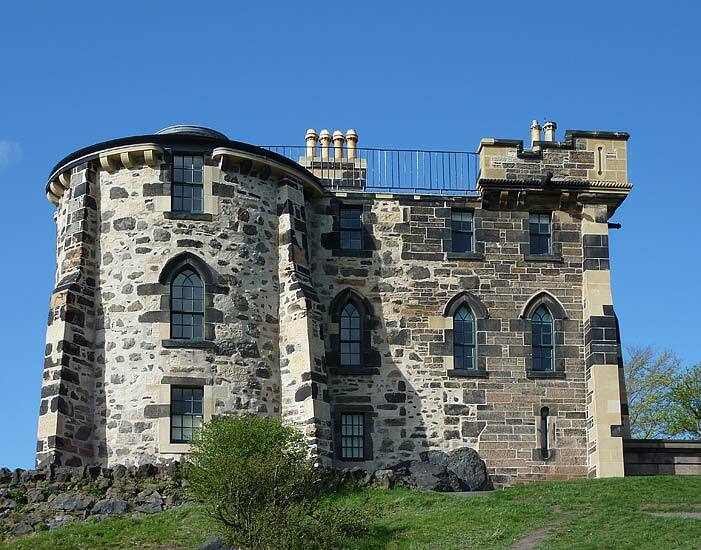 Addition at the NE of 1893, partly battlemented and partly crow-stepped, with pointed windows to match Craig's. 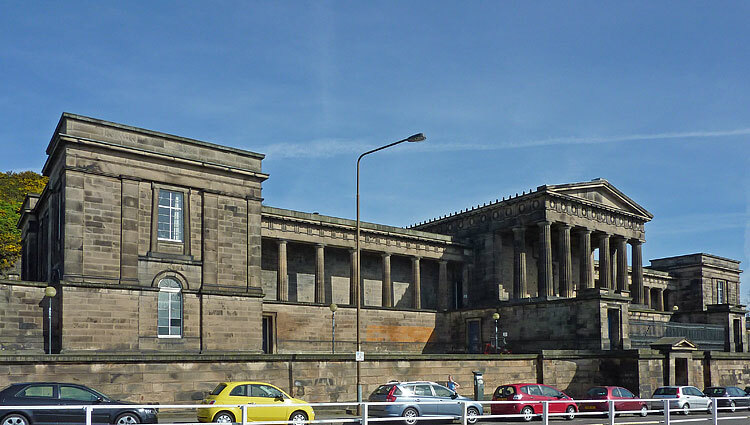 Third picture: Boundary wall of 1827 by Playfair with pedimented entries to the south and east. 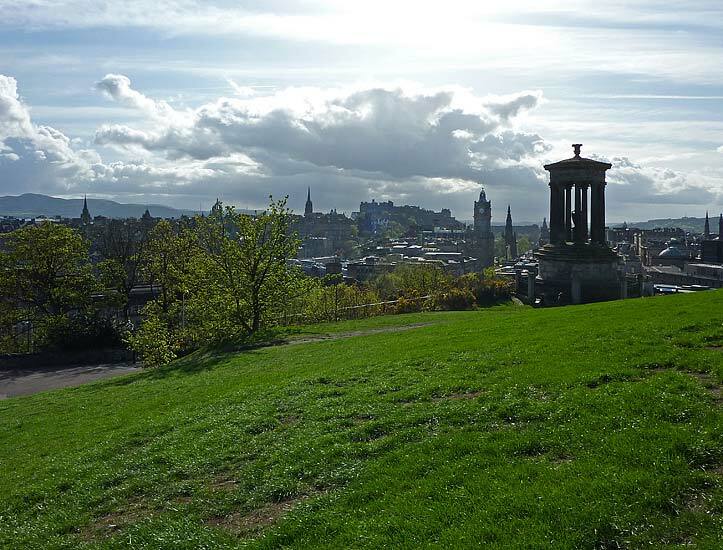 At the north-east corner the octagonal CITY DOME of 1895 by Robert Morham. 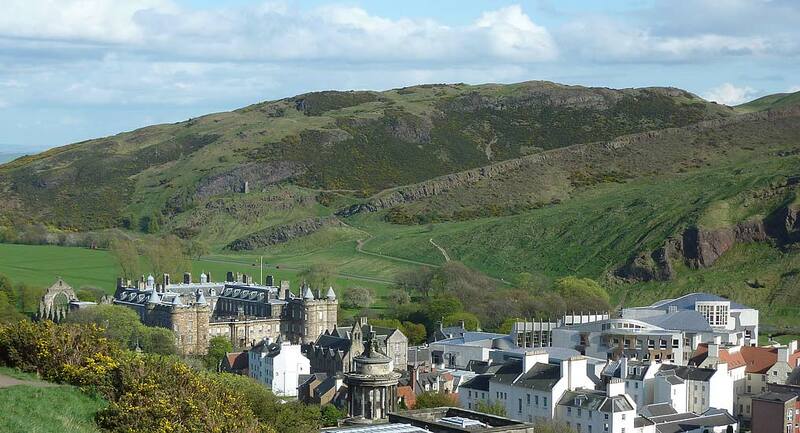 In first picture, Palace of Holyroodhouse on the left and the striking new Scottish Parliament building on the right by Enric Miralles ( More here). 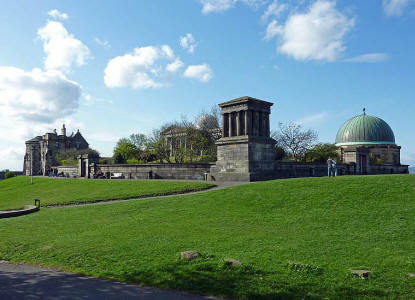 In the foreground, the rotunda of the Burns Monument. Middle picture, Canongate Kirk and Salisbury Crags in the background. 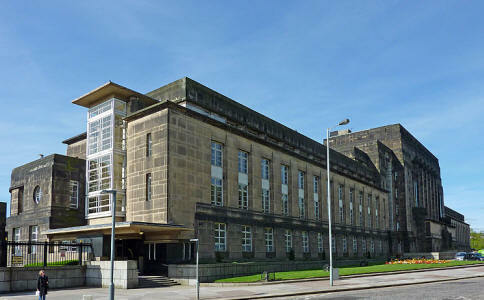 Third picture, Waverley Court, the new Edinburgh city council offices. 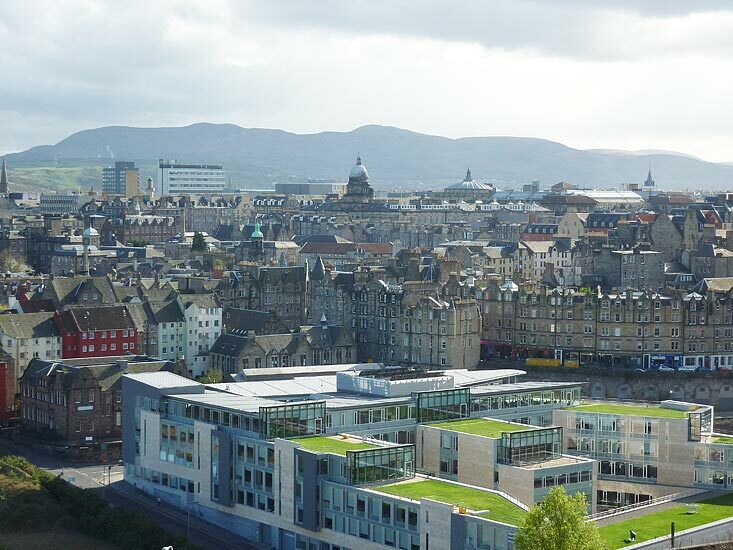 The Pentland Hills on the horizon. Dome of University of Edinburgh and to its right the flat dome of the McEwan Hall..
ST ANDREW'S HOUSE, south side of Regent Road. 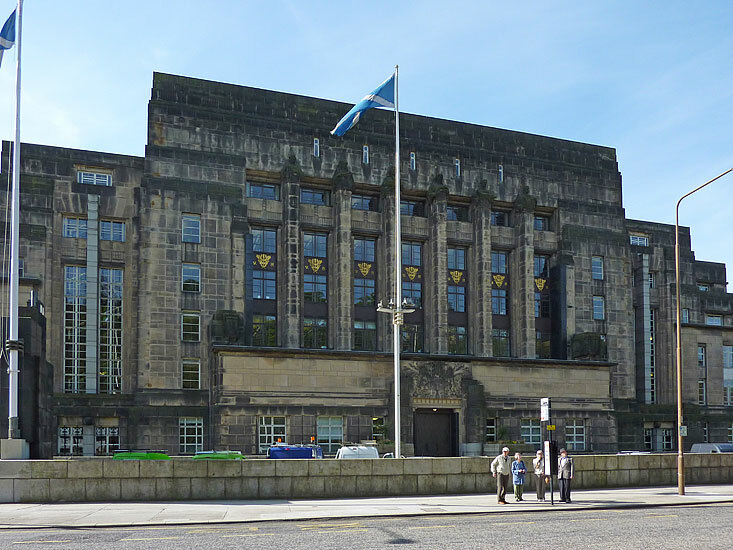 The main headquarters building of the Scottish Governement. 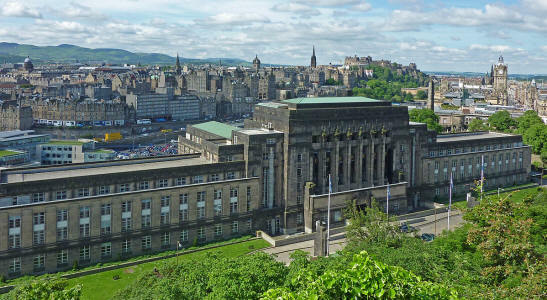 International modern, and by far the most impressive work of architecture in Scotland between the wars, built in 1936-9 to designs by Thomas S. Tait of John Burnet, Tait & Lorne to accommodate the principal departments of the Scottish Office. 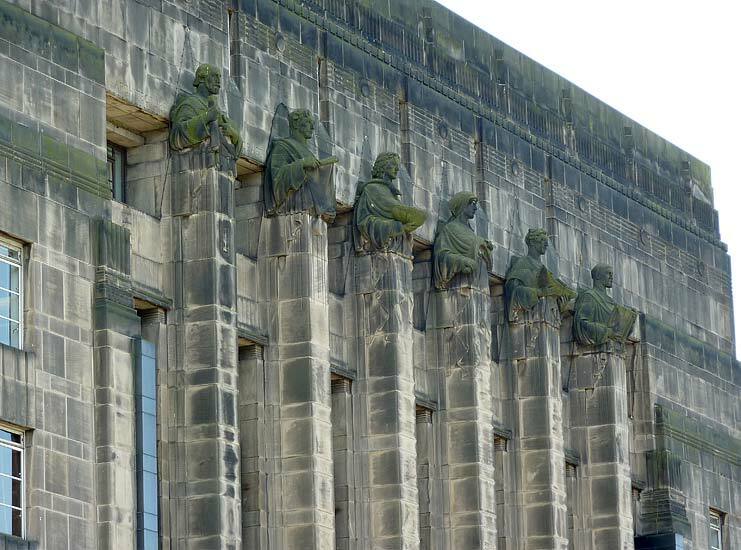 Its stylistic origins are diverse, but as a whole it is closest to Nénot's League of Nations building at Geneva; strictly symmetrical in the Beaux-Arts tradition, but much less classical and, in its exploitation of the dramatic view from the S (see further down), much more rhetorical, also, vast as it is, by no means so large. 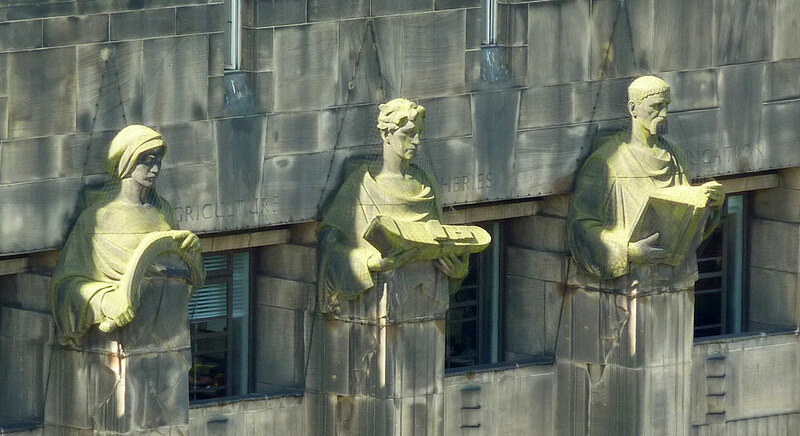 ... and beyond them long wings of twelve bays, with broad piers stopping short of the wall head. ... At the end cantilevered canopies, and metal and glass staircase bays sheltered by projecting roofs ... Its abstract qualities and consummate handling of detail cannot be denied. 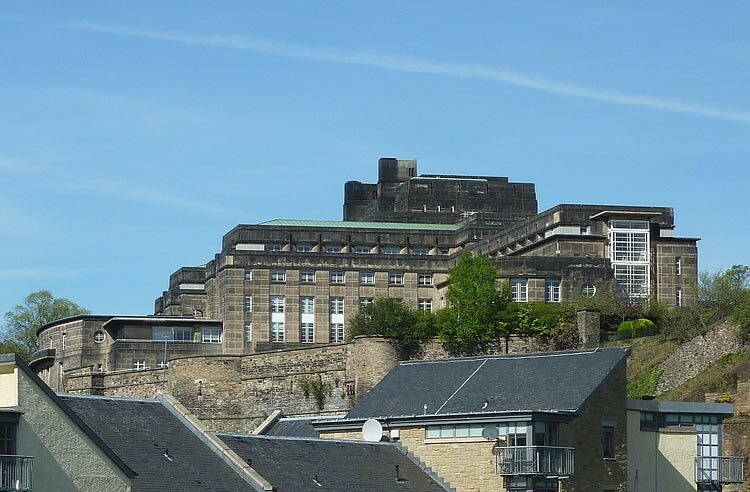 GAOL GOVERNOR'S HOUSE, to the west of St Andrew's House. 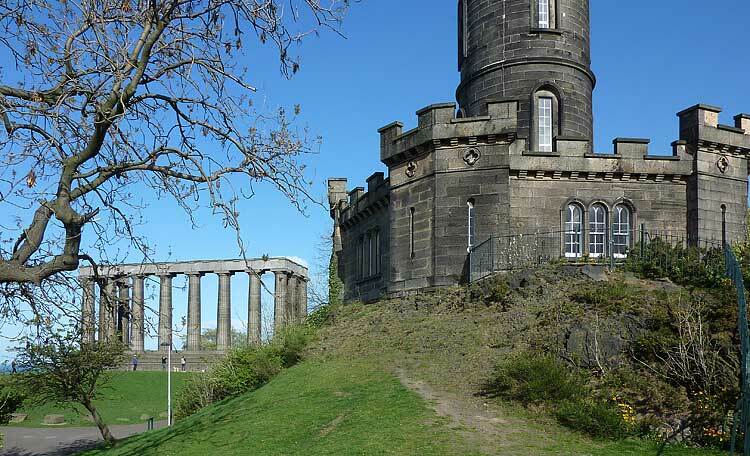 Battlemented, towered and turretted, this and the great wall below, by Archibald Elliott, 1815-17, are all that remains of what was in its time Scotland's largest prison. 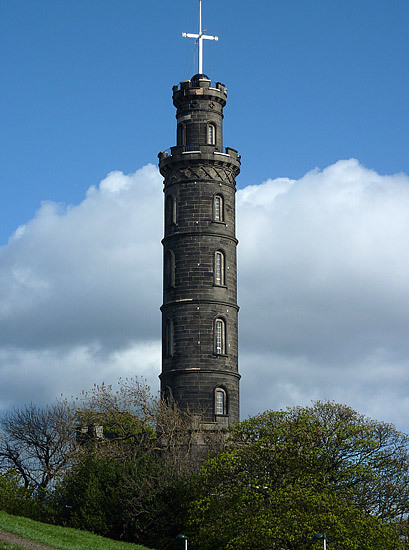 The MARTYRS' MONUMENT, 1844, is an obelisk by the architect Thomas Hamilton, commemorating the Political Martyrs of 1793. 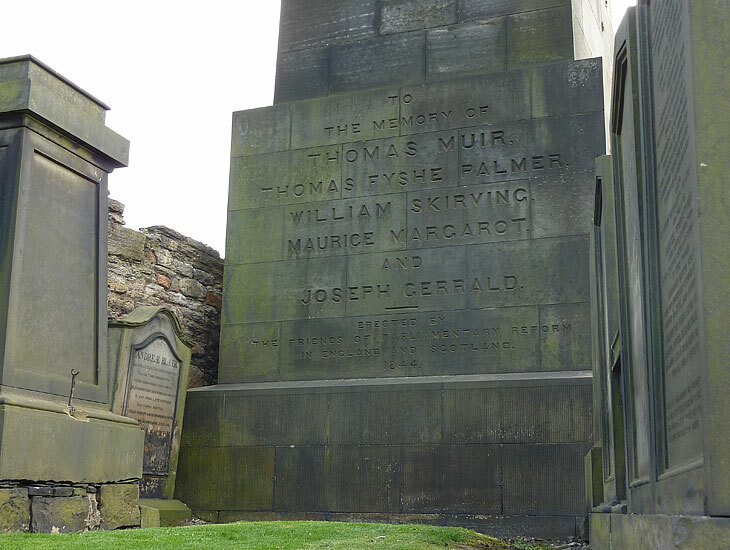 They had pushed for universal suffrage and were charged with treason for attempting to correspond with the French, then deported to Australia. More in Wikipedia.